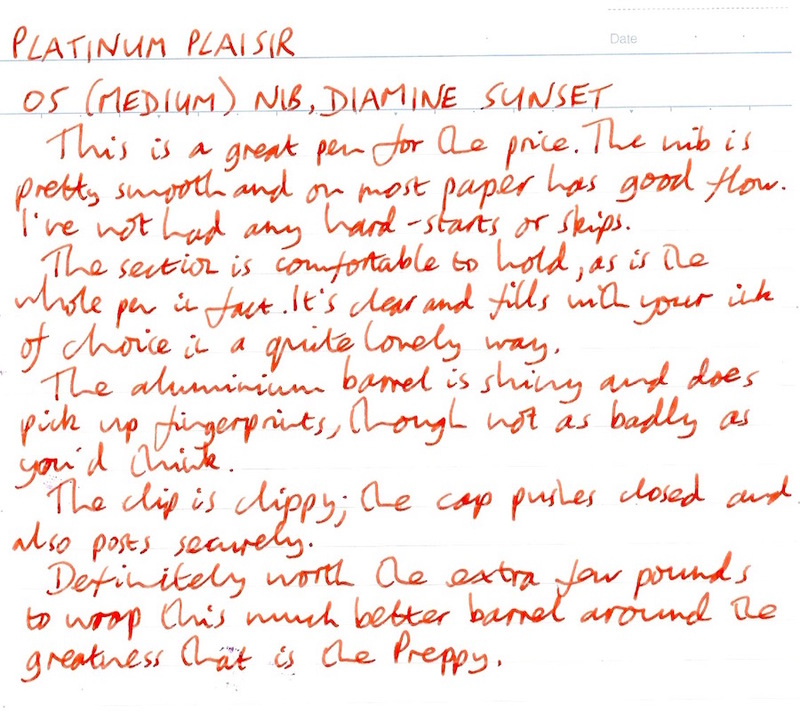 Platinum Plaisir Fountain Pen Review – Pens! Paper! Pencils! Platinum make some very beautiful and very expensive pens and some very ugly and very cheap pens. 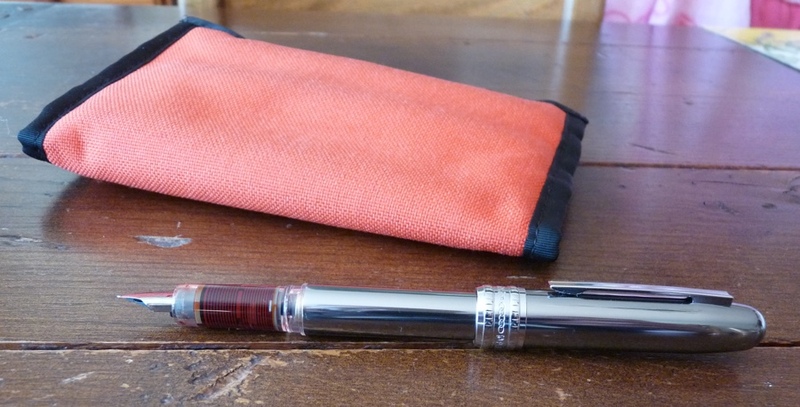 The Plaisir is an attempt to make a pen that’s relatively cheap yet not ugly. 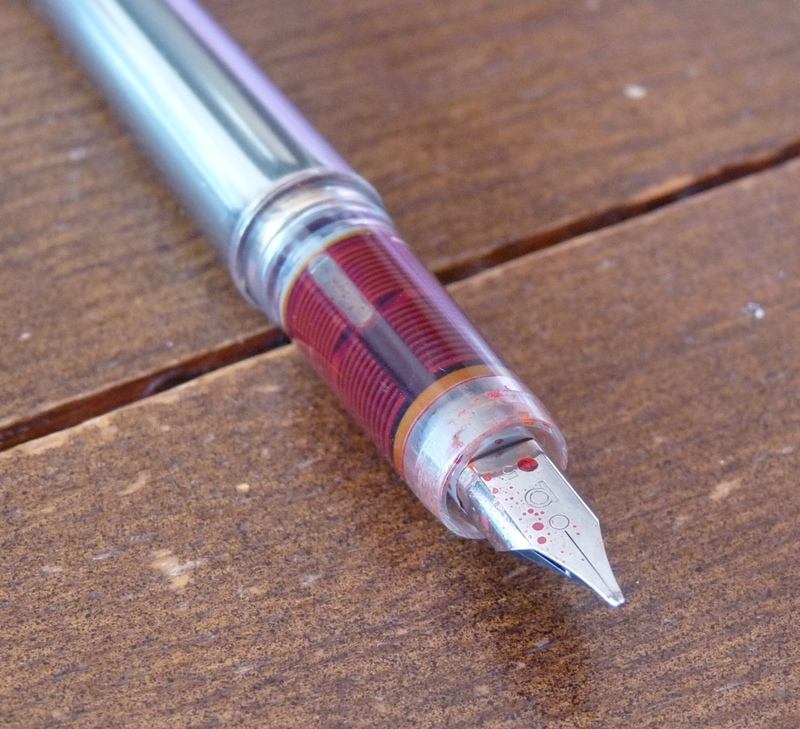 The Plaisir uses the same nib and feed as the Preppy. This isn’t a bad thing, although quality control can be, I hear, a little wonky. 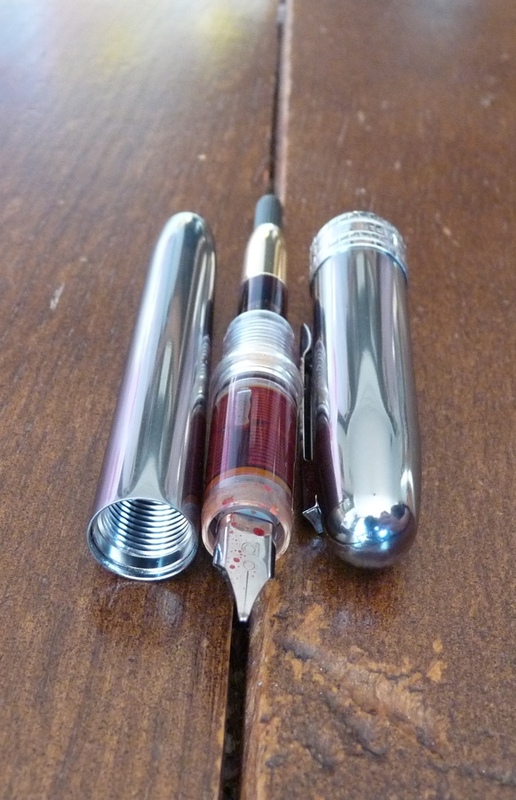 This pen (with an 05 nib) and the two Preppys (one 03, one 05) I have, are, however, all great writers. This one does run a little dry now and then on coated paper but it never stops altogether, starts writing first time every time, and is absolutely fine on uncoated paper. (I should note that others who’ve tried this pen haven’t found any dryness at all, so it could just be a minor issue with mine.) The nib isn’t buttery smooth and it’s very hard but it’s pretty good. There are plenty of pens costing two or three times as much with nibs no better. At this price you don’t get a nib with any kind of soul but the Plaisir does give you a nib that works as it should. Platinum use their own cartridges and converters. It’s possible to buy a converter to convert the cartridges (no need to convert the converter, of course). I’ve not tried it but it doesn’t cost much. 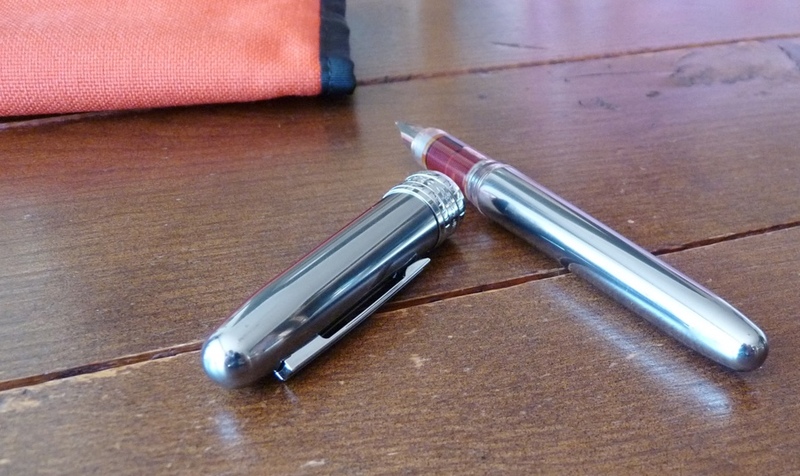 A converter isn’t included and buying one almost doubles the price of the pen. I stole one from one of my other Platinums. 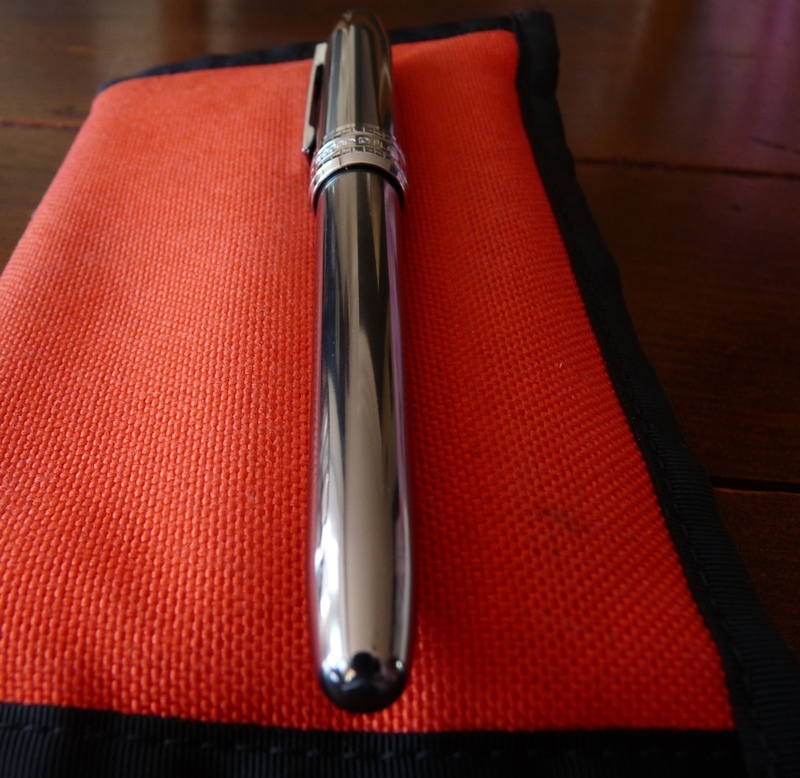 The pen’s made from aluminium and so is light without being flimsy. It’s anodised and very shiny. It’s obviously going to pick up fingerprints but it’s nowhere near as bad as you might think. The section is clear plastic and as the cap pushes on there are no threads to make holding it uncomfortable. The pen’s a comfortable length, too. The section looks lovely filled with ink. The cap posts deeply and securely and doesn’t unbalance the pen. You’ll have to make up your own mind about the wide band around the cap. I don’t like it myself. The clip is simple but the style, two raised edges, is a nice little nod to the style of the clips on the #3776 range. It’s strong and will perform its clipping duties faithfully. All in all, the Plaisir is a great pen for the money. It’s a nice writer, comfortable to hold, and if you like the shininess it looks great. This is my favorite “beater” fountain pen. It is dependable, sips ink, and writes great notes. I have the gunmetal grey with a fine nib.